Once upon a time there was an English teacher that did the most awesome class projects in the world. She would come up with a story for each of her students and hand them over on sheets of paper, each with its own personalized font, custom made to suit the tone of the story. If it was one that had princesses it would be cursive and almost sparkly, if it had monsters it would be more rough and, dare I say it, a bit scary. Or as scary as a font can be. Either way, she used fonts to get her pupils sucked into the stories she created and make them want to solve the puzzles and do their homework. Had I not been 10 or 11 at the time it would’ve been easy for me to ask her how she’s doing it all but I was so until recently this memory faded, only to be brought back by coming across a tool that would’ve helped a lot back then. 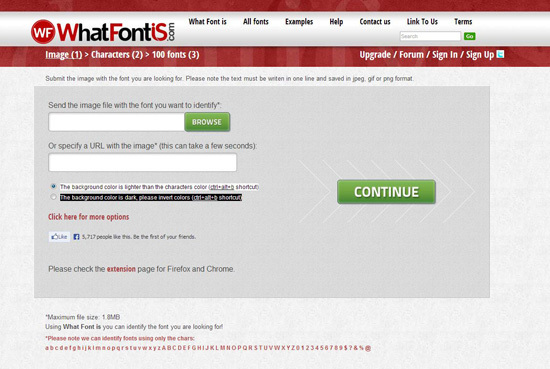 WhatFontIs is a website that lets you find a font you’ve been looking for but can’t quite pick out. Of course, there’s the traditional way of finding it, going to the respective bar and scrolling down until you manage to see one that resembles it, jot it down and then move on until the end of the list. Or you can upload the file that has the font, a picture of it or put in the link to it and let the website do its magic. Thirdly you just have to go ahead and confirm the letters WhatFontIs managed to recognize for you from its 280,000 strong database of fonts. As a side note, with that many options to search through you’re pretty much covered and even if you can’t find the exact match you’ll find one that’s so close it won’t even matter. Nevertheless, you’ll almost certainly find the font you’re looking for. That’s all there is to it and if you need to find a certain font to use on your project click here to visit: whatfontis.com.